Powered by a 58V lithium-ion rechargeable battery, the all-new Jonsered CC16i battery-powered string trimmer delivers the power, performance, and runtime typical of traditional gas-powered tools - without the hassle of mixing and storing fuel, or the harmful emissions. With impressive features like instant push-button starting with no pull cord, variable speed control, digital cruise control, and integrated power boost technology, this quiet, lightweight, ergonomically designed, and environmentally friendly trimmer is easy to start and easy to operate. It also features a telescoping shaft that quickly adjusts to a comfortable height for any user; a generous 16-inch cut path; bump-feed line advancement with dual line exit; and easy-loading trimmer head for fast, simple cutting line refills. Generous 16-inch cut path cuts wide swaths of grass and weeds. The BLACK+DECKER LHT2240C is a 40V MAX* Lithium Hedge Trimmer. Quickly trim hedges, shrubs and branches up to in. thick without tangling with an extension cord. This trimmers dual-action blade reduces vibration while you work**, and the trigger, handles and grip are all designed for comfort and maneuverability. A built-in charge indicator tells you at a glance how much battery power you have left. (**Compared to BLACK&DECKER single-action blade models). 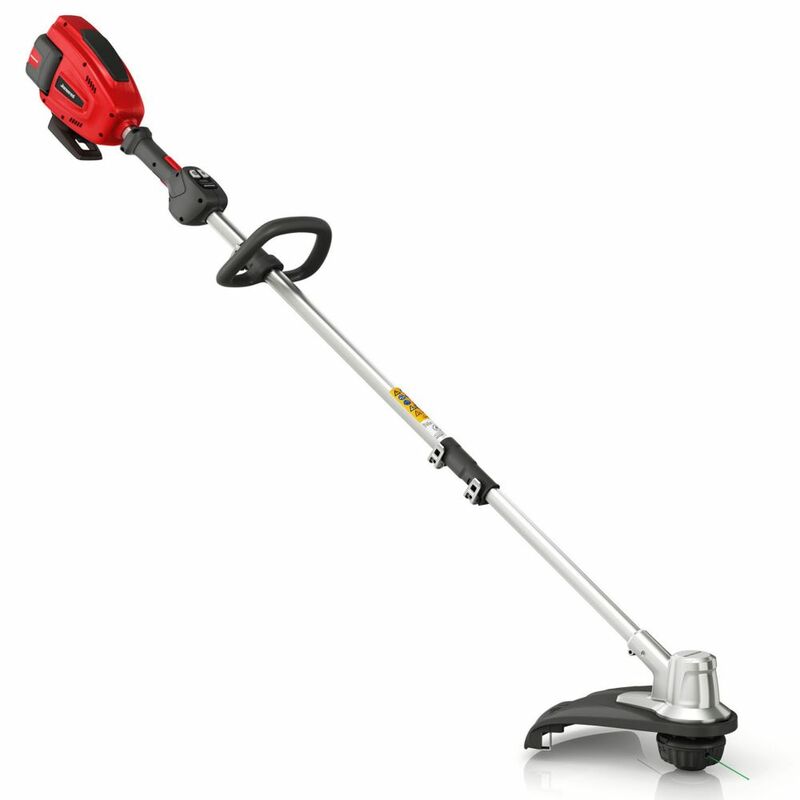 It is ideal for lawn and gardening season used for trimming hedges, shrubs, and bushes. It gets the job done without extension cords getting in the way. Introducing the world's first cordless hedge trimmer with a 1 inch cut capacity! The NEW EGO POWER+ Hedge Trimmer has a Hi-Efficiency Brushless Motor for longer run times and a 24" dual action, hardened steel blades for precise, clean cuts. The new EGO Hedge Trimmer is equipped with fully serviceable blades to make sharpening quick and easy. It delivers 3,000 strokes per minute to get the tough jobs done faster and features EGO's industry-leading ARC Lithium Battery Technology compatible with all EGO ARC Lithium batteries to maximize the convenience of cordless and deliver Power Beyond Belief. 58V Cordless String Trimmer, CC16i Powered by a 58V lithium-ion rechargeable battery, the all-new Jonsered CC16i battery-powered string trimmer delivers the power, performance, and runtime typical of traditional gas-powered tools - without the hassle of mixing and storing fuel, or the harmful emissions. With impressive features like instant push-button starting with no pull cord, variable speed control, digital cruise control, and integrated power boost technology, this quiet, lightweight, ergonomically designed, and environmentally friendly trimmer is easy to start and easy to operate. It also features a telescoping shaft that quickly adjusts to a comfortable height for any user; a generous 16-inch cut path; bump-feed line advancement with dual line exit; and easy-loading trimmer head for fast, simple cutting line refills. 58V Cordless String Trimmer, CC16i is rated 4.0 out of 5 by 1. Rated 4 out of 5 by Lonny from LOTS OF POWER FOR A BATTERY TRIMMER I purchased this JONSERED trimmer/blower combo at COSTCO 2 weeks ago. I have used it twice an my 1/2 acre yard. i had used a WORX PRODUCT PREVIOUSLY AND FOUND IT SLIGHTLY UNDERPOWERED COMPARED TO MY STIHL GAS TRIMMER. i have gone the battery opererated because of shoulder surgery. IT comes with only one battery for both pieces of equipment. WISH IT CAME WITH 2 BATTERIES OR AT LEAST A WAY TO ORDER ANOTHER ONE. The plus is the fast charger will fully charge battery in 30 minutes. BUT, YOU have to stop at some point before finishing trimming to recharge.Trimmer itself is amazingly powerful and can make short work for trimming about anywhere in the yard. what size trimmer line does this model take? Hello - This trimmer uses .095 inch trimmer line. Best of luck!